by Aleksandra Matulewska. Studies in Language and Communication. Volume 171. Bern [et al. ], Peter Lang, 2013. The author of the book, Aleksandra Matulewska, is an established legal translation scholar in Poland. She is the head of the Laboratory of Legilinguistics in the Institute of Linguistics at Adam Mickiewicz University of Poznań. She organises annual conferences on legal translation, court interpreting and legal linguistics (8th edition this year (2013)) and is a founder and the editor-in-chief of Comparative Legilinguistics. International Journal for Legal Communication. She wrote a book, Lingua Legis in Translation. English-Polish and Polish-English Translation of Legal Texts, published by Peter Lang in 2007 and based on her Ph.D. thesis. The book under review, Legilinguistic Translatology. A Parametric Approach to Legal Translation was written for the purposes of the Polish post-doctoral habilitacja degree and is therefore heavily theoretical. In her book, Aleksandra Matulewska proposes a theory of legal translation, which she also refers to as a parametric approach to legal translation and a new paradigm of inquiry (it would be very difficult to attain in Thomas Kuhn’s sense of this term). The objective of the book is, in her own words: “to propose a more precise theory of legilinguistic translation which may enable us to clearly distinguish primitive terms and postulates” (2013: 13). With this objective in mind, she parameterises legal translation and proposes a ‘translational algorithm’: (i) to make “the process of legal translation accessible to investigation” (2013: 13); (ii) to “help make the translator’s actions effective” (2013: 105); and (iii) “help discipline the translator” (2013: 253). Thus, her goals are both research- and practice-oriented. Chapter 1, Legal Language and Translation, briefly introduces basic theoretical concepts connected with legal language and translation, such as text typologies, equivalence, legal language, legal linguistics/legilinguistics and legal translation. Matulewska starts with a brief summary of Vermeer’s skopos theory. The discussion of theoretical concepts summarises approaches proposed mainly by three Polish scholars, Franciszek Grucza, Barbara Kielar and Danuta Kierzkowska with a view to making them accessible to an international audience. The review of international literature seems, somewhat surprisingly, to be based on secondary sources. For example, the discussion of equivalence in general translation draws heavily on Pisarska and Tomaszkiewicz’s Współczesne tendencje przekładoznawcze [Contemporary trends in Translation Studies], a well-known textbook published in Poland in 1996, as well as on Kielar’s book Tłumaczenie i koncepcje translatoryczne [Translation and approaches to translation] from 1988. The same applies to other general translation theoretical concepts discussed later on, in particular translation strategies/procedures and meaning in translation. 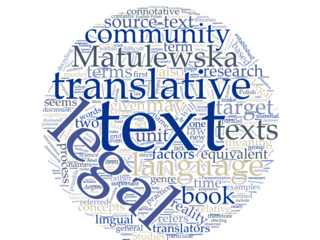 Although the author claims that the chapter presents “the state-of-the-art in the field of translative equivalence and legal translation” (2013: 253), the last two decades of translation research are virtually non-existent, which is a curious omission given the recent vibrant growth of the discipline. Overall, one would expect a more thorough theoretical grounding in a book purporting to propose a theory of legal translation. translational procedures, methods and strategies (2013: 69), the last group being illustrated with terminological examples. “If a translandive lingual unit is a collocation, then a translative lingual unit is based on a functional equivalent.” (2013: 83, 95). This is a desirable situation; however, it is not always possible. For example, if we deal with a system-bound term, which does not have its equivalent in the target language, it is highly likely that the entire script / mental model in which such a term is embedded is missing in the target language; hence, there will be no functional collocations for its equivalent. In such a case, it may be necessary to create a collocational neologism to deal with the conceptual lacuna. In other cases it may be necessary to create a collocational neologism to express a concept in a more accurate way at the expense of stylistic aesthetics (for example świadczyć usługi ‘to provide services’ versus dostarczać usługi ‘to deliver services’). Such creative collocations are not necessarily, as argued by Matulewska, “deficiencies” which “indicate the lack of specialized professional knowledge and either provoke[s] unpleasant comments or lead[s] to losing a client or even if [they] result in the distortion of meaning or ambiguity [they] may lead to far more unpleasant consequences such as being faced with disciplinary proceedings” (2013: 96). She acknowledges problems with finding collocational equivalents in Postulate 34 when the target language does not have a corresponding genre of texts (2013: 96), which is less likely than stumbling across a system-bound term. The final component is the explanation scheme which illustrates the decision-making process for two simple translation problems with reference to the postulates. Chapter 3 entitled Towards Parametrization of Translation discusses in more detail “legal translation relevant dimensions”, which were called “legilinguistic translational reality” in the preceding chapter. They include: (1) the source-text author, (2) translandum, translatum, and text component parts, (3) commission and commissioner, (4) translator, (5) communicative community. For example, translator-related dimensions include factors, such as his/her educational background, qualifications, personality, approach to the role of the translator, competence verification, information accessibility at the time of translation rendering and information retrieval skills. An important factor seems to be missing — namely, years and type of professional experience as a legal translator, which is a more important quality determinant than personal qualities, such as whether the translator is patient or impatient (cf. 2013: 129). Chapter 4 focuses on Calculating Translandive Text Meaning, which is equated with interpretation and construction (2013: 157) and referred to as deciphering and/or establishing the translandive meaning. In other words, it refers to what is commonly known in Translation Studies as decoding. Matulewska introduces a set of 10 dimensions which are critical in ST decoding and establishing equivalence: (1) the authorship of the source-text, (2) the source-text delivery form, (3) the source-text status, (4) the time of source text creation, (5) the branch of law to which the text refers, (6) the text genre, (7) the language of the source text, (8) the lect, (9) the source-text legal reality, (10) the source text language variety existence. This grid is next used to demonstrate how to establish the meaning of isolated terms, e.g. petitioner, assets, by reducing polysemy. 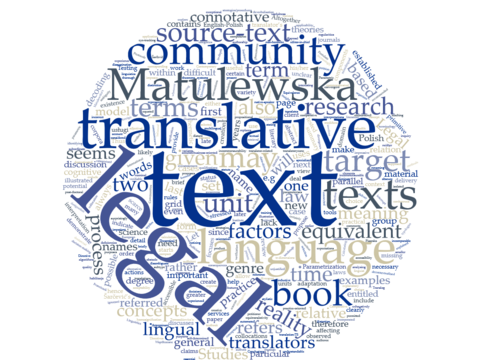 Matulewska concludes that “in order to calculate the meaning of the translandive unit the translator must have at his disposal the set of all potential meanings” (2013: 180). On the other hand, it may be argued that in practice it is context and co-text that disambiguate and block certain interpretations in a text and (experienced) translators do not need to (and do not have time to) consider all potential meanings and go through the proposed algorithm to understand a term in context. In other words, wherever possible, legal terms should be domesticated in literary translation. Chapter 6 In Quest for Sufficient Equivalence is in my opinion most useful for English-Polish translators as it contains some practical comparative discussion of insolvency terminology. As for the theoretical content, equivalence is established according to the grid of dimensions proposed in Chapter 4, that is: (1) the author of the source-text, (2) the source-text delivery form, (3) the source-text status, (4) the time of source text creation, (5) the branch of law to which the text refers, (6) the text genre, (7) the language of the source text, (8) the source-text legal reality, (9) the source text language variety existence. These factors are important, but as Matulewska notes, they are “not always sufficient to decide whether two terms are sufficiently equivalent or not” (2013: 217) and in such a case she uses Šarčević’s method (2007) whereby equivalents are selected by identifying accidental and essential features of terms. One cannot escape noticing that the grid of dimensions will be identical for all the translation problems encountered in the same text being translated; therefore, in most cases the translator will resort to Šarčević’s method. Thus, it is unclear how Matulewska’s theory improves on the approach proposed by Šarčević in 1997. Chapter 7 contains a translation algorithm which starts with “the source text meaning calculation and end[s] with the choice of an optimal significator” (2013: 240). In other words, it presents steps to be taken by a translator from decoding the message to its encoding. I am sceptical as to the applicability of algorithm in translation practice. Experienced legal translators will certainly have many choices automated as cognitive target language equivalents; neither would they have time for it. It should be also stressed that some translation scholars and linguists of a functional orientation (and I would count myself among them) a priori exclude translation algorithms and rules, emphasising that only certain regularities and tendencies may be observed, since translation always involves subjective interpretation and disambiguation, cf. Tabakowska, a leading Polish translation scholar and cognitive linguist (TABAKOWSKA 1990: 113). Nevertheless, the algorithm proposed by Matulewska may be useful in translator training to raise novice translators’ awareness of a multitude of factors affecting translation decisions. See for example Burukina’s paper on the application of the deverbalisation algorithm as a legal translation teaching method (BURUKINA 2007). Chapter 8 entitled Conclusions is one page long and contains a brief summary of the book. Overall, the book is an interesting analysis of factors affecting the selection of equivalents at the terminological level in legal translation. The factors were identified, categorised and discussed exhaustively. Undoubtedly, an impressive amount of work was put into their analysis. The major shortcomings of the book are terminological confusion and lack of terminological rigour. Matulewska renames well-known and fundamental Translation Studies concepts, such as source text, target text, legal translation, to name a few, with new opaque names: translandive texts, translative texts and legilinguistic translatology, respectively. The explanation that a translandive text is a source text is offered as late as on page 61, even though the author uses it from the very beginning. The rationale for renaming fundamental concepts is not provided. Additionally, the author does not apply the new names consistently but occasionally replaces them with standard names, which leaves the reader wondering whether or not they are synonyms. The proposed theory is complex in itself, with 71 postulates, 26 directives, 36 terms, and numerous dimensions; hence, this adds unnecessary complication and makes the reading difficult. lingual unit, source text unit, translative unit, source text translative unit, translative lingual unit, translandive lingual unit. Other terminological modifications are caused by incorrect adjectival derivation from the noun translation where English prefers nominal modifiers: translational theories, translative equivalence, translatological foundations, instead of translation theories, equivalence and translation/TS foundations, respectively. Another obstacle is the lack of native-speaker editing of the book to eliminate grammatical errors and adjust its style to EAP conventions. The proposed theory is very formalised, prescriptive and deductive (2013: 54) rather than inductive / data-driven and based on empirical research. Matulewska unfortunately excludes what she refers to as the ‘confirmatory’ component, stating somewhat mysteriously that it “has the form of verifiable empirical material. As such is the domain of research into corpora in translation and will not be discussed in more detail in this work” (2013: 56). Although in the conclusions the author claims that her approach is based on “an in-depth case study of translations and parallel text corpora” (2013: 14), the scarce examples from the empirical material come mainly from one branch of law (insolvency and bankruptcy law) and from very few genres and parallel texts (two professional journals, a winding-up petition and one statute from each jurisdiction). Secondly, the scarce examples present decontextualised terminological units, which do not account for textual phenomena. It also does not allow the reader to appreciate the need for applying such a complex model to what seems to be possible to explain in much simpler, commonsensical terms. Any theoretical model would have a greater value if substantiated with, and tested on, representative and balanced empirical material. Testing is not limited to corpus-based translation studies only. Furthermore, the next step of testing the theory which purports to explore the translation process (rather than the translation product) should be its grounding in so-called process research, which has been one of the thriving fields within Translation Studies in the last two decades but has not been incorporated in this publication. I refer in particular to TAPs (Think Alound Protocols), Translog keylogging software, eye-tracking software and other tools for analysing text production processes. Testing the model with these tools would give insight into the translation process itself and cognitive factors behind it. It would also allow the author to verify to what extent her theory and algorithm may be applied in practice. This can be a hint for further research. Since the theory has not been tested and verified in practice and since the author does not demonstrate how it improves on or rebuts other theories and approaches in general and legal translation, it is difficult to assess its usefulness. Calling it a new paradigm of research into legal translation is an overstatement, or at least it has not been sufficiently substantiated. Nevertheless, it should be stressed that the book is a valuable contribution to research into factors which are at play in legal translation. Legilinguistic Translatology. A Parametric Approach to Legal Translation. Bern: Peter Lang, 2013. ISBN 978-3-0343-1287-5. BURUKINA 2007 = Olga A. Burukina: “Legal translation: algorithm for the beginner in the Russian language realities.” In: Kierzkowska (ed. ): Court Interpreting and Legal Translation in the Enlarged Europe 2006; Warsaw: Translegis 2007, 90-98. KIELAR 1988 = Barbara Zofia Kielar: Tłumaczenie i koncepcje translatoryczne, Wrocław: Zakład Narodowy im. Ossolińskich Wydawnictwo PAN 1988. MUNDAY 2009 = Jeremy Munday: “Issues in translation studies.” In: Munday (ed. ): The Routledge Companion to Translation Studies. Revised edition; London and New York: Routledge 2009, 1–19. PISARSKA/TOMASZKIEWICZ 1996 = Alicja Pisarska, Teresa Tomaszkiewicz: Współczesne tendencje przekładoznawcze, Poznań: Wydawnictwo Naukowe UAM 1996. ŠARČEVIĆ 1997 = Susan Šarčević: New Approach to Legal Translation, The Hague: Kluwer Law International 1997. TABAKOWSKA 1990 = Elżbieta Tabakowska: “Językoznawstwo kognitywne a poetyka przekładu.” Teksty Drugie 3(3), 97–113. Dr hab. Łucja Biel is an Associate Professor and Acting Head of the Institute of Applied Linguistics, University of Warsaw, where she teaches and researches legal translation. She was a Visiting Lecturer on MA in Legal Translation at City University London from 2009 to 2014. She is a deputy editor of the 'Journal of Specialised Translation' and Secretary General of the European Society of Translation Studies (EST). She holds an MA in Translation Studies (Jagiellonian University of Kraków), PhD in Linguistics (University of Gdańsk), and Diploma in English and EU Law (University of Cambridge). She has published extensively on legal translation and translator training, including the journals 'The Translator', Meta. The Translators' Journal', 'The Journal of Specialised Translation', 'Fachsprache', 'Linguistica Antverpiensia', as well as the book 'Lost in the Eurofog. The Textual Fit of Translated Law' (Peter Lang, 2014). Biel, Łucja (2013). „Review of „Legilinguistic Translatology. A Parametric Approach to Legal Translation“ by Aleksandra Matulewska“. Zeitschrift für Europäische Rechtslinguistik (ZERL). Köln: Europäische Rechtslinguistik, http://zerl.uni-koeln.de/biel-2013-review-legilinguistic-translatology.html, (Datum des letzten Zugriffs). URN des PDFs: urn:nbn:de:hbz:38-66216.